Last year I hosted our annual family Easter get together and I decided on a brunch. I wanted to make it easy for every one who was coming but also wanted to make it special too. One of the ways I did so was to place an edible bird’s nests filled with an edible bird and eggs at each person’s places on each person’s plate setting. It doubled as a take home dessert/treat as well as a cute decorative item that gave the table that something special feel. 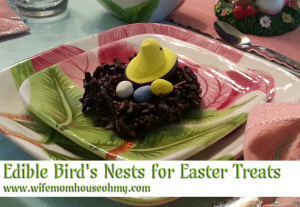 These edible bird’s nests were a perfect Easter treat, super cute and a big hit! Best part, is they were super easy to make. In fact, there are only 5 ingredients. 1. Prep by having a baking sheet standing by with wax paper or parchment paper lining it. 2. Fill a sauce pot two-thirds full with water. Place a double boiler on top. Add melting chocolate to double boiler and slowly stir chocolate as the water below begins to boil. 3. Once the chocolate has fully melted, stir in the chow mein noodles so they are completely covered in chocolate. 4. Scoop out balls of mixture that are large enough when shaped to hold a Peep chick and 3 robin’s eggs. Allow to cool. 5. Cool to touch – room temperature is better – shape the nests by pressing semi flat and cupping the nest to raise the sides. Place in the fridge to completely cool. Keep adjusting shape as they cool until they meet your desired look for a nest. 6. When they are completely cooled and you are ready to plate, place the Peep chick and 3 robin’s eggs in the nest. Serve or in my case, decorate! As promised a super cute, super easy, and sure to be a hit with your family too edible bird’s nests ready to be your family’s Easter treat. See you next post for more Easter fun! So cute and oh sooooo yummy! Glad you liked them. They were fun to make. And I’m a sucker for anything Peep.